Two beloved celebrities diagnosed with bipolar disorder have recently been featured in the news: singer Mariah Carey and actress Margot Kidder. Kidder in May died peacefully in her sleep at the age of 69. She rebounded from a period of homelessness in 1996 resulting from a severely manic episode. Despite the stigma associated with the illness, Kidder relocated from Los Angeles to Montana and resumed her movie career. Although some only knew her as Lois Lane alongside Christopher Reeve’s Superman, or “that crazy actress,” she decided to reclaim her life. Her extended period of recovery is a testament to the grit required to stay healthy and hopeful despite the stigma. Using my memoir, Defying the Verdict: My Bipolar Life (Curbside Splendor Publishing), as a vehicle, I leave the ranks of the silently successful as did Mariah Carey and Margot Kidder. Having accepted the challenges associated with living with Bipolar I disorder, I have lived in recovery from a maturing form of the illness for more than 25 years. Defying the Verdict begins with medical records that authenticate the severity of my mental illness. The reader is then introduced to my wonderfully eccentric grandmother whose bipolar illness was foreboding for me as a young girl. Somewhere within me, I suspected this illness would be my destiny. In 1982, I had a psychotic break that was frighteningly reminiscent of my grandmother’s illness. It threatened to derail my undergraduate career at Wesleyan University two months before graduation. At that time, my parents took me to a therapist who agreed with the Bipolar I diagnosis I received in 1980. However, he added an unexpected prognosis: given the severity and frequency of my episodes –those swings from elation to despair—my parents should brace themselves for my eventual need for custodial care. Like Mariah Carey and Margot Kidder, I believe removing the stigma of mental illness will allow more people to come out of hiding and seek restorative healthcare. In Defying the Verdict: My Bipolar Life, I explain how I applied Norman Cousins’ quote: “Don’t defy the diagnosis, try to defy the verdict.” After accepting my accurate diagnosis, I turned over every psychic memory that impeded my mental health. No longer in therapy, I eat well, exercise, meditate, pray and visit my psychiatrist quarterly for medication management. I am leading a full life as an African-American, fundamentalist Christian woman who lives with a mental health diagnosis. And I must mention….I serve as care manager for my aging parents. 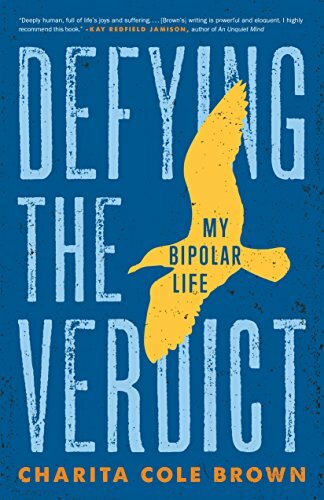 Defying the Verdict: My Bipolar Life is now available to purchase. Charita Brown earned a BA in English from Wesleyan University and an MAT in Early Childhood Education from Towson University in Maryland. She is now retired and lives in Baltimore with her two daughters.